In a silk-lined niche, there is a figurine group made out of Bisque Porcelain, a material that demonstrates an ease of formability and soft surface. The composition shows Joseph and Mary kneeling next to the manger where Jesus lies. Behind this, there is a shepherd who is holding his crook in his right hand over his chest, and looks down on to the parents and their loving gaze to the holy child. On the base, the following can be read: "Jesus, Mary and Joseph - enlighten, save and help us", a line from the 30 days of devotion to honour Saint Joseph. The niche is surrounded by a neo-Gothic alter piece. This decoration is attached directly to the glass, and displays a rise in the floor that is decorated with new pinnacles. In the niche between the pillars, Saint Peter and Saint Paul are standing, easily recognisable by their attributes of a key and a book respectively. 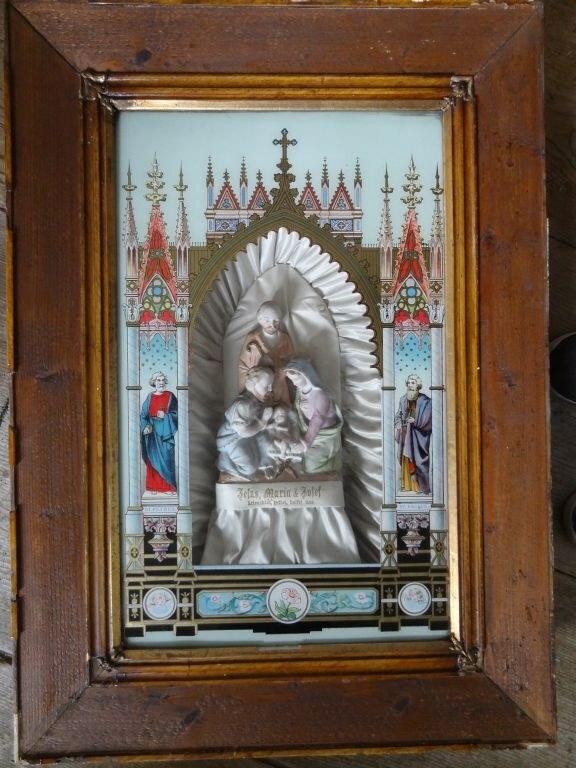 The picture is enclosed with a shaped wooden frame painted brown. The musical mechanism is activated on the side of the box and, in addition to the church hymn "Holy God, we praise thy name", it also plays "Silent night, holy night".